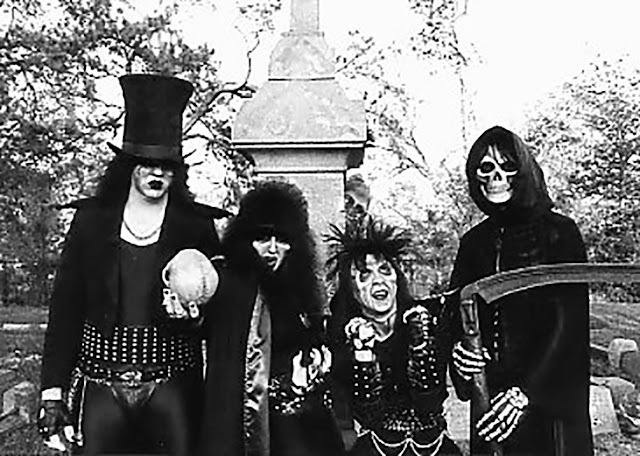 The band had only one album in the 80's – “…And The Dead Shall Rise”, which was a good time for metal. How active were you in that period? I joined in '80. We released an EP cassette, then came "...And The Dead Shall Rise", which also spawned 3 tracks on various metal compilation albums, namely 'Metal Massacre VIII' by Metal Blade Records, 'Metal That Matters' by Azra Records and 'Death Metal Revenge' by New Renassaince Records, all within about a year of that release. Did participation in these compilations open some doors for the band? Was it difficult to reach listeners, to organize gigs and etc.? Brian Slagel and Bill Metoyer became very interested at that point, and wanted what ultimately became 'The Dead Have Rizen' in 2009 to be released by Metal Blade Records in 1987. Of course, we had already relocated to L.A. by this time, and before we could seal the deal, we lost 2 members within a few weeks, and before we could properly replace them, the label lost interest. Gigs were easy, but the listeners were totally off-radar, steeped in the extreme underground. Bittersweet situation. What were your surroundings in the 80’s? Where did you usually play? When did you decide to use the dark glam image? We only played a handful of shows in the Houston metro before moving to Los Angeles. That offstage look didn’t really have a proper definition in those days, probably just being a mixture of what you'd call glam or goth today. We never went anywhere dressed in shorts and Nike's, if you get my meaning. We held our offstage outings to certain limitations, dress-wise. How was “…And The Dead Shall Rise” album accepted by fans? And why was Ripper disbanded in the 90's? It was well received in the extreme underground (where it remains to this day), but went no further. We lost 2 members in L.A., and after many months of trying to replace them, we disbanded. The chemistry on the debut was irreplaceable I'm afraid. What was going on from the 90's - 2005? What made you return to Ripper? I shelved my musical ambitions from '90 to '97, when I began to dabble in it once more, reviving songs that would have been our follow-up record had we not disbanded, many of which ended up on 'The Dead Have Rizen'. I felt the fans deserved some closure from all the years of underground web-support, so I began recording and releasing again. After Ripper disbanded the project was reformed in 2005. How did you gather new line-up? There was no live lineup. Just myself and some select friends, though they were all busy with other projects as well, and could not commit to me full-time. How old was stuff of “The Dead Have Rizen” when you record it? Did you keep it since 90’s? I wrote it in '87 after 2 members left, while either hoping they would return, or that we could replace them, and of course, neither happened. Do you play gigs with Ripper now? No. There is still no live lineup. I've been looking for quite awhile, but finding the right people isn't as easy as it might seem. It’s complicated. Why is it a problem now to find people to play in Ripper? By the way, did you ask members of first lineup about it? How did Black Widow Records get you into their nets? Tobias Piwek from 'Doggysmile Pictures' (Germany) arranged the correspondence between us. They've released new Ripper album "Third Witness" on May 2015, as your previous work “The Dead Have Rizen” has seen the light of day almost ten years ago. How actually long did you compose these songs? The songs from the last album were written in '87 after the split. Some of the songs for 'Third Witness' were written around 2013, and others during the same period as 'The Dead Have Rizen'. How do you see strongest sides of new record? Guitar heavy & hypnotic, with good vocals (for once). What’s lineup took part in record session of “Third Witness”? How did process in studio go? Robert Bogle, son of my producer Stephen Bogle, played drums on tracks 1-4. My old friend Don Ramirez ( 'Sinister Minister', 'The Dead Have Rizen' ) took on tracks 5-8. Rus Gib was brought in to handle the vocal chores on tracks 1-7, and I handled all of the guitar and bass duties myself, with Stephen taking charge of the synth and effects. Things went in stages, but smoothly. These new songs sound pretty old school yet fresh and driving, do you feel that this album is actual nowadays? It’s a throwback in the vein of the first 4 'Sabbath albums, with a touch of classic rock & prog thrown in, at the special request of the label. Most reviews have been positive, but unfortunately, most of the reviewers cant seem to do anything but compare us to one band or another, which is frustrating, since I know the album sounds original, and stands alone in production and sheer raw metal power amongst its peers. There's cover version of Black Sabbath song on the album with Steve Sylvester on vocals. How did you come to this collaboration? Initially, he was going to do the entire record, but his schedule wouldn't allow him the time to compose, so his contribution ended with the cover. Can you tell a story of creation of one of your favorite song from “Third Witness”? I was lying flat on my back in a hospital, and in a lot of pain, when finally I started receiving a morphine injection every 4 hours. I secretly named the nurse Morphinia, but she was none the wiser. I've got a question from Ripper's dedicated fan: what's about reissue of first Ripper full length record with bonus tracks? Well, Rob, really, what's about it? I've arranged to go through many old 1/4" reels to hear what’s on them. If there’s anything I feel is worthy, I may submit some to BWR for the next re-issue of the debut. Okay, Rob, thanks for your answers! One more thing before the curtain fall – what are your plans for Ripper? My immediate plans for Ripper are to continue to record and release albums via Black Widow Records whenever they send me back into the studio for a new one, which is usually every 2 to 3 years. I'd like to thank the readers for their continued support of underground heavy metal in general, and ask them to keep an eye out for all future Ripper releases. I will not disappoint!